This is an empowerment story that recounts the key events of a week-long workshop hosted by Goretti Pala and Sira Tauriki, Lecturers from the School of Nursing & Allied Health Sciences, Solomon Island National University (SINU) and co-facilitated by Michael Millington from the Centre for Disability Research & Policy at the University of Sydney. Our original plan brought educators, students, practitioners and advocates together for two days of training on the role of empowerment in Community Based Rehabilitation (CBR) followed by three days of field work gathering CBR empowerment stories from people with disabilities and their families. Story-gathering was tasked to the educators, who were collaborating on CBR curriculum development at SINU. This development plan was premised on the belief that: (a) inclusive CBR education is founded on, and responsive to, the lived experience of disability in the community; (b) an empowering CBR program builds curriculum around these stories, and in the voices of those who lived them; and (c) in a truly empowered program, people with disabilities are teachers, practitioners, and students of CBR – their stories in these roles need to be shared. Training and story collection were initially two separate activities. True to our empowerment model, the workshop evolved in response to participant interests. Students and practitioners were interested in deeper involvement in the development of the actual CBR empowerment stories. They wanted to learn how to find and develop empowerment stories in the community. They wanted ownership of the process. What was originally a task for educators became a week-long social-learning exercise for the group. Workshop planners visited two sites in the community that are important to CBR in Honiara: Kokonut Pacific and Bethesda Disability Training and Support Centre. Both will participate in future development of CBR training at SINU with very different empowerment stories. Our first visit was to Kokonut Pacific Solomon Islands where we met Brian, a graduate from the SINU CBR program and an operations supervisor at Kokonut Pacific (KP). Brian explained that KP is a for-profit social enterprise that produces and sells virgin coconut oil and related products. The KP mission is to “provide empowerment to remote rural villages on tropical coasts of developing countries”. KP supports a network of autonomous coconut production businesses in villages across the islands – empowering “through trade, not aid”. Village businesses are autonomous trade partners. They create jobs in the village, control production, and build local wealth through the KP network. KP’s belief in “Opportunity for all who are prepared to work” is put into practice through Brian’s expertise in CBR. He showed us a workshop space where an employee who had come to KP through CBR fashioned personal items (soap dishes, cups, bowls, etc.) for commission sale in the KP retail shop. Brian then introduced us to James, a KP employee who tended the brazier where coconuts were broken up and dried. James’ job site had been re-designed to match his physical capacity. Brian’s efforts to improve physical access for James had a positive impact on the other workers as well. He had the uneven and poorly drained yard filled and levelled to improve mobility. This had the added benefit of resolving a longstanding mud problem that slowed production and fouled the shop. Brian showed us where KP was constructing an accessible bathroom that raised the quality of work life for everyone. Through Brian, KP had made inclusion and empowerment profitable. Brian was a bridge between KP and CBR. His work generated livelihood opportunities throughout the KP network, and helped KP fulfil its mission. Brian was also a bridge between SINU’s CBR education program and KP. Together they explore opportunities for enriching the educational experience of CBR students. Now we were exploring KP as a source for empowerment stories. 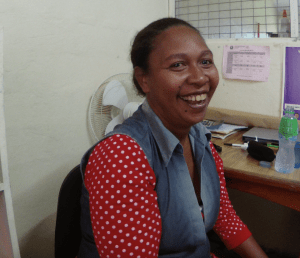 The Bethesda Disability Training and Support Centre is an influential player in community efforts to expand CBR/CBID in the Solomon Islands. It is a hub for skills training (both daily living and vocational) and a source for health, business, and literacy education for people with disabilities. Our visit to Bethesda was part of the SINU programme’s on-going partnership. SINU graduates have worked there. Plans for expanding internships for students are under discussion. We came to build on these initiatives. Perhaps sharing empowerment stories could become part of the internship experience. Before the workshop, we visited Bethesda and spoke at length with its Principal, Gideon Row. Bethesda began in 2009 with scarce funding, hard and short deadlines for proving their worth, and little support from the government. Today, Bethesda graduates find or create work, reintegrate into their communities, and join self-support groups to sustain their success. The training programme has expanded from six weeks to 20 and prepares now to expand to a full year – with a vision for two year programmes, an expanding arrays of training options, a self-sustaining institution, and a strong partnership in CBR education. Changing the hearts and minds of the governmental ministries remains a challenge. Gideon believes that education (and perseverance) is the key. Gideon explained that education was the “how-to” of advocacy at all levels. It’s role in building individual capacity is self-apparent in Bethesda’s graduates. But CBR also educates families, villages, and governments. They do so directly through awareness training, but also through example and collaboration. Ministry officials need to hear these stories to learn a new way of thinking about people with disabilities and the programmes that serve them. Gideon uses the success stories of Bethesda graduates and the on-going story of a self-sustaining Bethesda to teach government about CBR the Pacific Way. He highlights Bethesda’s success as a case study for government. He holds it up as a model for how to build economic capacity in a struggling economy. By consistently focusing on success and pointing to plans and potential, he keeps the lessons of CBR before the ministers and decision-makers of government. Bethesda is a patient teacher of the value of community support and role of government in supporting community. Bethesda’s model of education as a means of empowerment has direct implications for the evolving SINU CBR/CBID curriculum. SINU students do fieldwork placements here. During their placement, CBR students (along with Bethesda teachers) create and run sporting activities, teach health-awareness, and implement simple therapy/activity sessions for Bethesda students. SINU students engage in informal project-based learning, as they explore how such activities can be graded or adapted to suit the needs of each individual student at Bethesda. During our visit, SINU and Bethesda discussed the expansion of internships for CBR students; we saw an opportunity to build story collection into these learning experiences. Gideon suggested that Bethesda could be an effective laboratory for teaching CBR practitioner “how to teach” and to use effective teaching and learning strategies as practitioner tools for advocacy and inclusive community development. By the beginning of the first day, we were already adapting the workshop to facilitate group involvement in the collection of empowerment stories. Moving from one-on-one interviews to a group approach would require some rethinking. But first things first: we had to learn more about empowerment and ourselves. The morning session began with a warm-up exercise that explored the role of social empowerment in CBR. Practitioners took the lead in this activity. The objective was to create a map that described how CBR worked in the community. First, the practitioners shared a personal CBR success story in small groups. They identified all of the stakeholders in the story and drew a circle on the map for each one. They then connected the circles with arrows that indicated how information flowed from person to person. 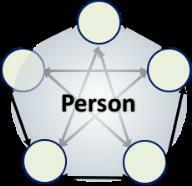 They described the relationships between the stakeholders that they had identified. When they were done, they had drawn a network of support with the person served firmly at the centre of care. The groups told their success stories through the map they had created. CBR in the health domain built a network around a boy with cerebral palsy. All lines led to the mother as the child’s primary carer and advocate, liaison to health service, and head of household. CBR training was the source of mother’s influence on the system. Mother trained family members and directed family support. The story about CBR in the education domain repeated the theme of CBR workers as educators. CBR provided skill training to family members on strategies of support; used educational events to raise awareness in the community; and informed and influenced school boards as expert advisors. The third group focused on the CBR domain of Livelihood. Their presentation focused on social learning as the key to progress and the importance of education to long term success. Participants with disabilities took the lead in the afternoon session. They shared their personal empowerment stories, while their colleagues practiced listening. Here, the important first step of creating a safe place for story telling was the objective. The first story built on the idea of social empowerment through social support that was the theme in the morning session. We heard the story of a young girl who was having difficulties in school and how her family ties and links to CBR helped address issues of negative attitudes, bias and bullying. 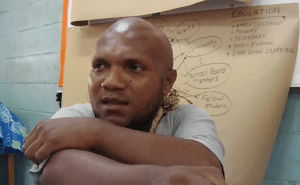 Ellington Kabui, a member of the Persons With Disability Solomon Islands (PWDSI), told a powerful story of education and empowerment that began here and continued through the week’s conversations. He shared several experiences of great conflict where he fought against family, school, and service providers that he felt were limiting his access to education. He recognised that his behavior sometimes seemed challenging to the people in charge, but he was intent on being taken seriously and on getting an education. When his parents would not pay for his schooling, he found a way to fund it. When they would not feed him at boarding school, he lived on water. His response could go beyond challenging… For example, having been denied food and coming home to more of the same, he burnt down his family’s outdoor kitchen. “What’s the use of having a kitchen when you can’t cook food in it?” When he needed money to pay for school, he was not above hustling the Honorary Consular of Israel for funds he could divert to this purpose. Ellington fought hard for his early education because he saw it as way to become more powerful. He continues to pursue his education. He is currently doing his Form 7 studies at the University of the South Pacific, Honiara campus. Now Ellington helps struggling students to succeed. He offers them help in completing their assignments in exchange for food, money, or favours. By the beginning of day two, we had a strategy for collecting empowerment stories through the workshop groups. Most of our story collection activities would take place in the CBR offices on the SINU campus. The offices had a common space with furniture, air conditioning and an adjoining kitchen. We also decided to split the workshop into two groups, for morning and afternoon sessions. This way our story telling guests would not be overwhelmed by the size of the group. We also decided as a group that everyone could be interviewers, asking questions as they chose. The morning session focused on practical interview techniques to help people tell their stories. We turned the group interview into a guided conversation to make everyone as comfortable as possible. Story telling is a community activity, not a clinical one, so we kept it simple and accessible. The interviewers focused on active listening as their primary tool. They encouraged the story teller to talk about life roles and describe the activities of their daily lives. The key is to get the story teller to start talking about themselves, listen intently, and let your curiosity guide the questions. When you find the moments when people respond to challenges, that is where you find stories. We developed and modelled our group-interviewing strategy over a story that involved the morning session attendees (CBR practitioners and their supervisor). Grace Teka shared this story of social learning among CBR workers and empowerment in the family from her experience as a CBR fieldworker. The story begins with Grace visiting a family to assess a child’s needs for accommodations in the home. CBR workers met with the parents, and together they developed a plan that included a custom-fit wheel chair for mobility, an accessible toilet, and a special chair to support the child at feeding time – a chair made of cardboard. The first home visit went smoothly, and the plan was put into place. The follow up visit to check on plan progression was puzzling. Upon arrival, the child was not in the accessible home as they had expected. They found him at the grandparent’s home instead. When the CBR fieldworkers asked about the cardboard feeding chair, they found it in pieces. Grandparents explained that the chair had been used for feeding, but also to facilitate playtime with siblings. The chair apparently worked well, at first. But the cardboard could not stand up to the climbing and jumping of child’s play. Back in the office, the CBR team discussed field observations and appropriate response. The most obvious interpretation was that the chair had been misused; the most obvious response was parent (and grandparent) training. The workshop group reconsidered the evidence from an empowerment perspective: The family had found another use for the chair. The chair had allowed the child to join in play time with his siblings. The chair had expanded play opportunities for all. Perhaps the empowered response would be to focus on durability, rather than use? The broken chair was telling a larger inclusion story than was first perceived. The afternoon interview was the first test of our group strategy with an actual story teller. Mary was seated on the couch, surrounded by people she knew well. When the interview began, the group turned to the workshop facilitator for introductions and opening questions. As the interview progressed, it became clear that Mary was not comfortable. And the reason was apparent. The visiting educator was a stranger amongst her friends. He brought cameras and tripods. He did not speak the local language. And the group seemed to defer to him as he spoke. This was not a safe space for story-telling. The group adapted quickly. At tea, the stranger retreated to the kitchen to fetch Mary a cup of milk tea, and then remained on the periphery for the remainder of her visit. Sira, one of the SINU educators, took over the lead role in the circle. With food and good humour the group relaxed into a comfortable conversation. Mary began to talk cheerfully with her friends in Pidgin, and the group responded in kind. “Tea” never really ended, but became the safe place we were looking for. Day 3 would be fully dedicated to empowerment stories. We adapted the group interview strategy based on lessons learned with Mary. Sira would lead the groups now. We would emphasize conversation over interview even more than before. Guests and group members were encouraged to converse in whatever language suited them. The debriefing session that followed yesterday’s group interview was a valuable shared learning experience. It would be repeated in today’s sessions. The morning session began with the trip to see Damina. The group wanted to take the workshop out into the field. We felt empowerment stories were best heard in the spaces where they occurred, in this case Damina’s home. The trip took us into the hills outside of Honiara. We passed her school on the way. The foot path to her house was steep and slick with rain. We were greeted at the door by her father who led us in and introduced us to Damina. Damina has been a very successful student. She is quick to learn, and has ambitions to pursue an advanced education. She wants to become a lawyer one day. Her father is dedicated to her upbringing and supports her academic achievements. 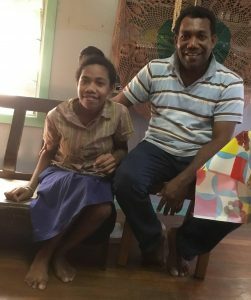 Between the two of them, they have managed to overcome the challenges that restricted mobility causes in her school career. However, as she approaches her teenage years, walking becomes increasingly difficult and mobility solutions are harder to find. They convinced the school to move her classes to the ground floor. That helped. But soon she won’t be able to navigate the path to the toilet. Father sought medical care as a means to improve mobility. Surgery could help, but access had thus far been denied. Without proper treatment, she would continue to lose mobility. Without mobility, school would soon become inaccessible. Without school, there would be no path for her career. This was the discussion we had at Damina’s house. The workshop group was becoming more comfortable with the group process. Sira led the group and the conversation flowed in and out of Pidgin as the story unfolded. When the proper interview drew to a close, father and daughter offered their guests a tray of fruit. For the second time, the presence of food and an act of hospitality created a safe and sociable space where the real work was done. At the request of one of the teachers Damina demonstrated her capacity for walking. This impromptu assessment generated problem-solving ideas, specifically around exercises, talk of options and plans for the future. The impact of our visiting became clear in the weeks that followed. The post-interview conversations inspired participants to make connections in their networks on behalf of Damina. Networking led to the treatment that father had sought. What began as an empowerment story became active advocacy. It was here that health, education, livelihood, mobility, and even advocacy came together in the experience of workshop participants. The group had become part of Damina’s on-going story. Teaching became practice in CBR. Shadrack’s session was the first to take place completely in Pidgin. Sira led once again. Everyone seemed more comfortable. The questions from the group seemed more natural. Participants had learned to simply engage and be curious, and let the story teller tell their story. Perhaps having such a sociable guest helped, perhaps it was the language, or skill development. It was likely all three. Shadrack acquired a spinal cord injury and told the story of his path back to a new life. When CBR workers first met Shadrack, the space of his life was no bigger than his room. They thought he was very quiet, reserved, shy. In truth he was isolated, alone, and without direction. CBR provided the vehicle for his future travels – his wheelchair. His world began to expand almost immediately. With mobility, he regained access to his house, then the yard, and then onto the street. 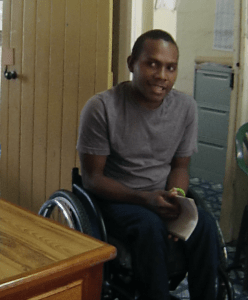 His assistive device (an appropriate wheelchair) enabled him to attend school (Bethesda Disability Training and Support Centre) for six weeks in 2010. Bethesda provided direction: at school, he was empowered to come out of his shell, he started to talk to people, attend prayer and eventually he was comfortable interacting with other people from his community. Shadrack described how his time at Bethesda helped him see that he could do things, that he could have a future. After the training at Bethesda, Shadrack got a job at World Vision, Solomon Islands; where he worked as a filing clerk for four years. He had a good experience at World Vision. Shadrack started playing para table tennis in 2010 and competed twice in Fiji. He builds his confidence through sport and singing. Now he is thinking about careers and ways to return to sport – particularly table tennis. We completed the cycle of stories where we began, with a story from one of the workshop participants. Diana’s story was still unfolding at the time she told it, and it caused us all to stop and reconsider how we look at CBR. Diana provided transportation to and from appointments for a man who used a wheelchair. As he became accustom to her presence, he also became overly familiar, and abusive, with her. He berated her and demanded her presence, began trying to control her life. As a person with a disability and an advocate, she did not accept this from him. She stopped providing transportation. He demanded to know where she was and in a conversation with Diana, it became clear that he believed they were in a personal relationship. This was news to Diana and she told him so. He threatened her with physical violence. No one took it seriously at the time, but hearing her recall the threat put the workshop group on edge. He sought to enlist someone to carry out his physical threat, but no one took him seriously. He changed tactics. He accused her of stealing his shoes. Diana went to the police station to answer questions, alone, without counsel. She signed a paper that she later came to understand was an admission of guilt. She had not taken his shoes, but she had no voice in the matter at that point. She was compelled by the police to spend weekends at the station – not in a cell, but under arrest. As she told her story, the threat of incarceration was still part of her daily life. Where was CBR in this story? Justice has a place in the CBR matrix that traditional CBR would not address. Advocacy of people with disabilities in the justice system was not part of the CBR curriculum. The traditional therapist roles that shaped CBR in the past lack the knowledge and skill to navigate these aspects of community inclusion. Her story, told in this empowerment forum, was the last of the week. And it pointed directly to our work in education and the work before us to reimagine the student, the practitioner, and the teacher of CBR. The stories we collected from individuals and their families who participate in CBR are seeds for further development. Goretti and Sira wanted more than static classroom case studies. They wanted people with disabilities to teach CBR students about their lives. 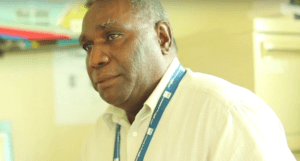 They wanted students to leave the classroom and find CBR in the homes and neighbourhoods of Honiara. They wanted students to learn how to draw out deeper stories that would improve their practice. SINU continues to develop these stories and partnerships in the community. Even if we are stripped of all our external resources, we can still share our knowledge. This act of sharing knowledge builds community and creates the capacity for change. Education creates hope and possibility. It is the source of personal power and as Ellington showed us, a driving force that makes us resilient. We are all educators and students. We are all experts of our own experience and our experience needs to be shared and celebrated in an inclusive community. CBR is based on a set of articulated values that can be found in the principles of the UN Convention on the Rights of Persons with Disabilities. It is a value-driven practice. That is to say the values come first, and the practice arises from our efforts to fulfil them. The same approach we take with practice, we must take with the education of the practitioners. We have to use and develop pedagogical skills that model the inclusivity, empowerment, and community we expect them to deliver in practice. We must walk the walk within the lesson. Empowerment is not a feature of the individual, it is characteristic of the transaction between the person and their environment. It is expressed at the personal level as individual resilience, to respond positively to challenge and influence others. It is expressed at the social level as group resilience; the interdependent relationships that supports the individual within the family and contributes to the health and identity of the family itself. It is finally expressed in the collective as the power of people en masse to change society, to move towards a more inclusive community. CBR Educators must teach practice in the twin tracks of supporting people and building community. Currently there is no track for the latter. Where there are gaps in practice, as Diane showed us, there will be gaps in the curriculum. We have yet to readily identify the knowledge and skills of the future CBR practitioner – educators are obliged to explore this space with their students and in collaboration with people with disability. Current pedagogical practice must break down the barriers between classroom and community. As Damina showed us, something new is revealed in community-based learning. CBR practitioners site teaching as universal strategy used, and yet it is not part of the curriculum. This was apparent across stories. Empowerment in CBR mandates that we educate others in and beyond the CBR community. School boards, ministries, industry, police…every institution in society has to learn about its role in inclusion as we move towards CBID. CBR education at SINU continues to evolve. It does not do so alone. It is partnering with the CBR programme at Fiji National University. They share their experiences with FNU as they share their empowerment stories. Together they seek to develop CBR practice in the Pacific, expand its reach and deepen its influence. 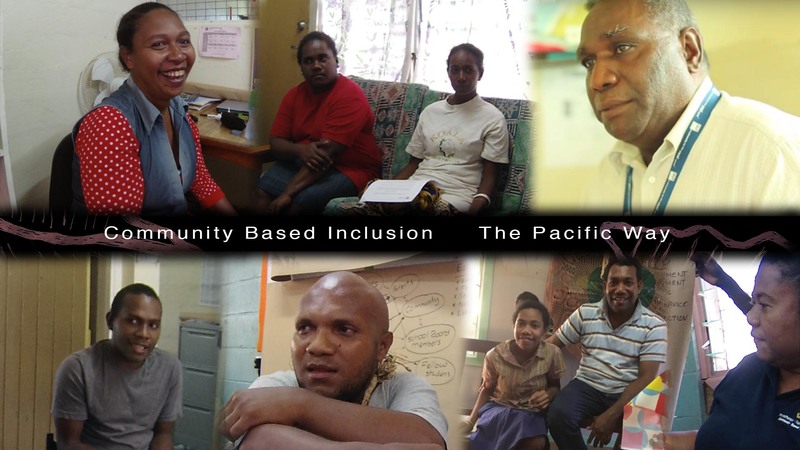 They are developing a pedagogy of empowerment, the Pacific Way.